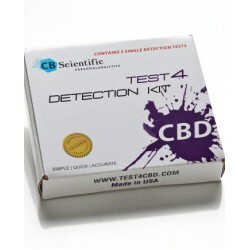 The Test4 Personal Cannabinoid Detection Kit allows you to detect CBD in any product. Now you can t.. The Test4 Edibles Personal Cannabinoid Detection Kit allows you to detect THC in any product. Now yo..
Take all the guess work out of making butter, oils, infusions and recipes for you favorite herbs. Se.. The Test4 THC Personal Cannabinoid Detection Kit allows you to detect THC in any product. " On the S.. The Test4 Combo Personal Detection Kit allows you to detect THC and CBD in any product. Now you can ..
uPREP Laboratory Test Kit uPREP/CBScientific provides an anonymous, safe, legal and cost effective ..